Location:	 Vero Beach, FL, United States Price: 199,500 USD SOLD! Witha Squeeze is a very clean and well-maintained 40' sedan bridge cruiser with two staterooms and two heads. The interior is light and airy and the exterior offers plenty of entertaining and relaxation space. 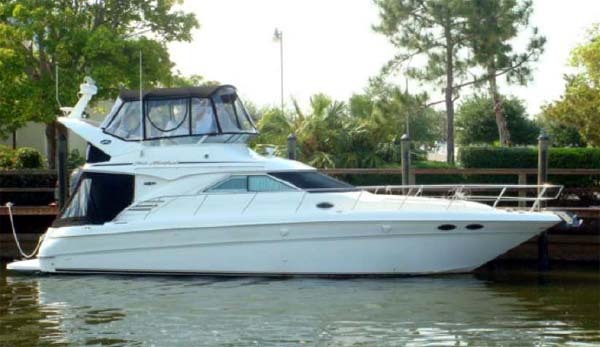 This very popular model has always been a top seller for Sea Ray and this one is turn-key and priced to sell. There is also a full aftdeck enclosure for off-season cruising. Witha Squeeze is really worth inspecting ASAP! Contact Curtis via curtis@curtisstokes.net or call 954.684.0218 for more information and an appointment to view this motor yacht. CurtisStokes.net provides the yachts for sale and charter yacht vessel description information contained herein as a convenience to the website user and does not in any manner warrant or otherwise guarantee the accuracy of such information. Some featured yachts for sale or charter vessels are not for sale to U. S. residents citizens while the yacht is in U.S. waters. Buyer assumes responsibility to verify all speeds, capacities, consumption's and other measurements contained herein and otherwise provided and agrees to instruct his agent/s to confirm such details prior to purchase. Yachts, ships and other vessels are, prior to sale, subject to price and inventory changes and withdrawal from market without notice.